Congratulations to the finalists for the 2016 Edna Staebler Award for Creative Non-Fiction, which were revealed yesterday. 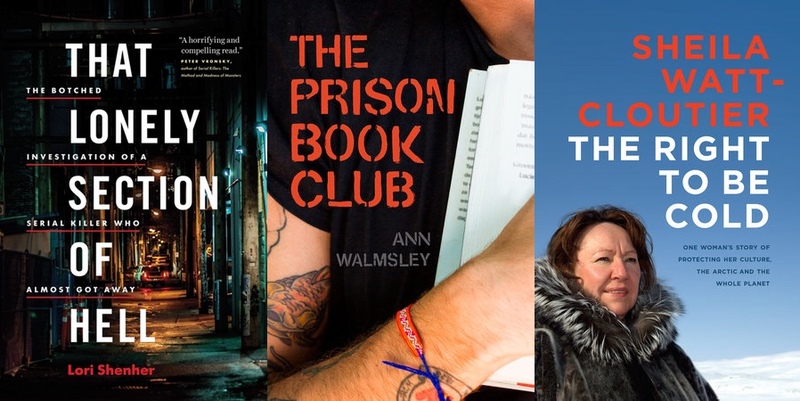 They are: Lorimer Shenher for That Lonely Section of Hell, Ann Walmsley for The Prison Book Club and Sheila Watt-Cloutier for The Right to Be Cold. The winner will be revealed later this month, with the award ceremony to take place on Nov. 3 at Wilfrid Laurier University’s Waterloo campus. This is the 25th anniversary of the award, so there are lots of special events in the works, including a conversation with the winning author at Laurier’s Brantford campus on Nov. 4, which I will host. For more information about the finalists and to see how the judges described them, check out the university’s news release.